In a word – JetPack. VaultPress was a standalone service, but now it has been integrated with Jetpack, meaning you need to install Jetpack first to use VaultPress. You have to at least partially turn on XML-RPC to use JetPack. That put’s an unacceptable security hole on your site and is the main reason I yanked VaultPress off my recommended list. The other reason is Jetpack itself. It comes preloaded with 19 modules turned on. And after you get through turning off all of that, then you still have to connect and configure VaultPress. In a word – money. Jetpack has millions of users and is a great way to attract more clients to Automattic’s other paid services such as VaultPress and Akismet. On 1/12/17 I contacted VaultPress support to get an update on the status of the changeover. Following is a brief of their reply. New VaultPress users must install Jetpack first. Current users of VaultPress can continue to use it via the standalone VaultPress plugin, without having to install Jetpack for the time being. Eventually all users, current and new, will have to install Jetpack. No date has been given for when current users will have to switch. Eventually the standalone VaultPress plugin will be removed from the WordPress repository. No timeline for when. 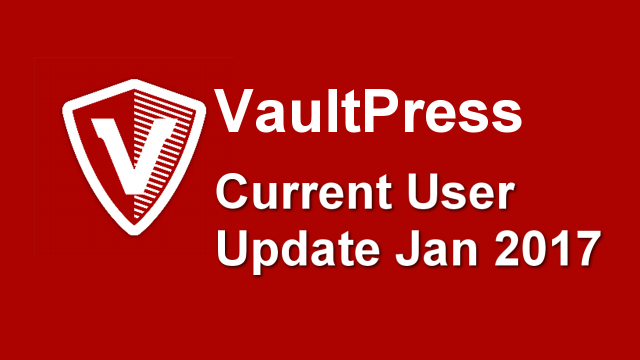 VaultPress is aware of the XML-RPC issue and is working to address it. No timeline given. I asked if renewals for current users would be at the new rates if they didn’t switch over to Jetpack at that time. I asked if new users could install Jetpack, connect VaultPress, then switch over to just the VaultPress plugin and delete JetPack. That way you could turn XML-RPC on just long enough to get things connected, then turn it back off, as VaultPress does not require XML-RPC to work. Jetpack does. They didn’t deny that you could do this, but didn’t endorse it either. And no one is sure how long such a thing would last anyway. For now, I’m still using VaultPress while giving the Automattic team time to work this out. But then, I have the luxury of waiting, as my renewal dates are still a few months away. Basically, they very much want to get new folks over into the new plan and setup while they work out the flow and logistics of changing over current VaultPress customers. The question for me and you is, do we want to renew if our time comes up while they are still working all of this out? I’ll make that decision when my renewal comes up, and you’ll need to decide for yourself. All the hoops you have to jump through with using Jetpack is a royal mess, in my opinion. Still, it may be worth doing to get the nice VaultPress backup service, and at a lower cost. We’ll see. I’ll keep you posted as this situation progresses. Be sure to subscribe to BlogAid News and my blog posts too, so you’re always up to date. I am just checking out a new service called WP Time capsule but it currently only has daily backups for free and the paid real time backups like VaultPress is coming with no definite ETA. Thanks for letting me know about the new backup service Dale. Always happy to know about new services. We were on the Vaultpress Basic plan ($165 / yr) for the real-time backups & the backup archive. Now, to get real-time backups, we’d need the $299 / yr Jetpack Professional plan. So definitely not a “price drop” here. Holy cow Vee! I thought they were dropping prices across the board. Guess not!! Hope you find something else suitable. I believe BlogVault might be a good option, if you haven’t already checked them out.